The American Balint Society is a supportive and collaborative organization of clinicians and teachers whose common values are promoted through a group process of exploration and training called the Balint group. The goal of the Balint group experience is for the participants to transform uncertainty, confusion, and difficulty in the doctor-patient relationship into understanding and meaning that nurture a more therapeutic alliance between clinician and patient. We appreciate the use of intellect, emotion, empathy and self-reflection in the doctor's work and we value the therapeutic potential of the clinician-patient relationship. The ABS was born in May 1990, formed by those medical educators convened at a Balint theme day at the annual meeting of the Society of Teachers of Family Medicine in Seattle, Washington. Until that time, a number of faculty in Family Medicine programs throughout the US had been leading Balint groups autonomously, and according to their own understandings of the teachings of Michael and Enid Balint. Eighty-five interested people participated in this maiden effort, resulting in the election of officers and a governing council that were charged with the development of this organization along lines similar to the Balint Societies that existed in England and many other countries. By 1993 The ABS was prepared to hold its first Leadership Intensive, in Wild Dunes, SC. This four day experiential workshop format has evolved and is now repeated multiple times a year at locations nationwide; several hundred Balint leaders have received training in this venue. In 1999, in Sayre, PA, an initial Credentialing workshop was held to certify qualified Balint leaders; to date 50 people have achieved this designation in the American Balint Society. The founders and early leaders of the ABS have achieved Emeritus Councilor status as the Society grows and thrives, becoming a vital force in patient-centered medicine and the development of the therapeutic relationship. We are proud of the quality of our leadership training and outreach activities, and invite your participation. 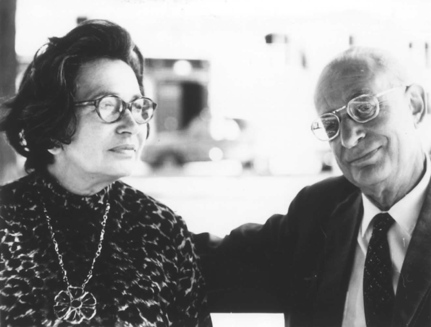 Michael and Enid Balint were psychoanalysts who started seminars for GPs (Family Physicians)in London in the 1950s. The aim was to help the doctors with the psychological aspect of their patients' problems - and their problems with their patients. The focus of the work was on the doctor-patient relationship: what it meant, how it could be used helpfully, why it so often broke down with doctor and patient failing to understand each other. In the early years the doctors were encouraged to hold "long interviews" before presenting a patient and sawy themselves as offering a kind of formal psychotherapy to certain patients over a limited period. Later on the Balints became more interested in what went on between doctor and patient in ordinary brief consultations, sometimes over a period of years. The long interview was now described as "a foreign body" in general practice. The emphasis had shifted to understanding the ordinary discourse of general practice rather than trying to turn GPs into psychotherapists for selected patients - John Salinsky MB, June 1997. Michael and Enid Balint coined the term “patient-centered medicine.” After Michael's death Enid updated the term and discussed its implications in one of her papers. Balint Groups provide a method to train doctors and other healing professionals how to apply a patient-centered approach.